Ben LaCross of Leelenau Fruit Company prunes young cherry trees. On a sunny but cold day at a cherry orchard north of Cedar, second-generation cherry farmer Ben LaCross, of Leelanau Fruit Company, prunes some young cherry trees with electric shears. “We’re trying to open up the scaffolds of the limbs to let more light in and force the tree to grow in the direction that we want it to,” LaCross says. Tart cherries are used by food manufacturers in things like cherry pies and turnovers. 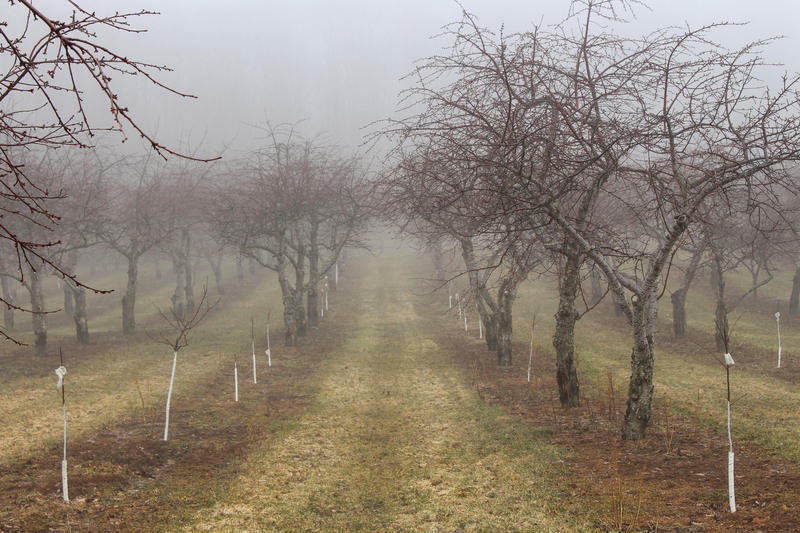 LaCross hopes that, come spring, this pruning will maximize the orchard's yield. That would mean a lot because many tart cherry farmers across Michigan are treading water. They face stiff foreign competition. Specifically from the country of Turkey, who for years has flooded U.S. markets with their tart cherries. When this started around 2012, it was actually a good thing. Domestic cherry farmers had a few bad years in a row, and Turkish cherries came in and met demand. But when U.S. crops bounced back, farmers were boxed out. Some of Turkey’s cherry products were going for about half the price of domestic ones. Farmers like LaCross are calling foul. “Every year that we’re dealing with these Turkish cherries, we’re looking at basically a loss year on our farms,” LaCross says. 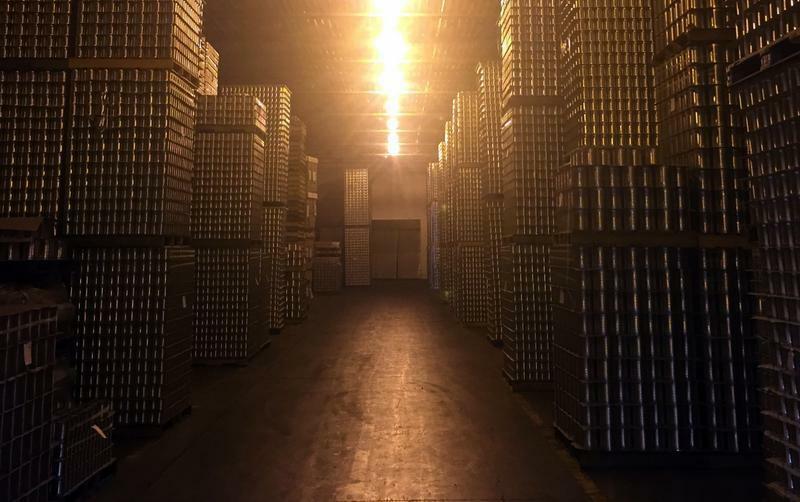 Burnette Foods stores excess cherries in an Elk Rapids warehouse. Turkish cherries are cheaper because evidence suggests tart cherries are highly subsidized by Turkey's government and, until a few months ago, came into the U.S. tariff-free. LaCross and other cherry farmers say those subsidies allow Turkey to sell them below the cost of production. “If we can’t defend our domestic market against unfair foreign competition, we might as well not be in business anymore,” LaCross says. According to the Cherry Marketing Institute, the U.S. was importing about 24 million pounds of Turkish cherry products annually in 2008. As of 2016, that number is more than 200 million pounds. For a long time, there wasn’t much tart cherry farmers could do about this. Unlike bigger industries, they aren’t equipped to go after an entire country’s trade practices. So U.S. Sen. Gary Peters (D-Mich.) wants the federal government to step in. He introduced legislation last month to make the Commerce Department investigate those Turkish subsidies. “We need the Department of Commerce to be much more aggressive when it comes to looking at actions being taken to undercut small industries,” Peters says. If the Commerce Department finds out those cherries are heavily subsidized, the U.S. can levy tariffs to offset the price difference. Peters says that’s on the table. “The key is ... to make a price that is consistent with what it actually costs to grow cherries and not to be subsidized from the government,” Peters says. In a meeting with Peters, President Donald Trump said his administration wants to help cherry farmers. "I think it's a fantastic idea, because you're right they can't hire the lawyers," Trump says. "It's too small, but in a double way, it's very, very big." In the fall, the Trump administration put a small tariff on tart cherry juice concentrate from Turkey. Michigan cherry farmers say that’s a good sign, but it’s mostly a symbolic indication that the president is on their side. Many say they want steeper tariffs on more products. But International Economics Professor Alan Deardorff says that may have some unintended consequences. Deardorff, who teaches at the University of Michigan, says tariffs may drive cherry prices up, but that would bring demand down. “You’re trying to raise the price for your producers so that they’ll be better off, and you’re willing to do that even though you know you’re going to inflict more harm on the buyers,” Deardorff says. A tart cherry orchard in Michigan. Cherry farmer Ben LaCross says food manufacturers that make cherry pies and turnovers would bear the brunt of any price hike - not consumers. And even if cherry prices go up at the grocery store, LaCross says they would still be cheaper than a decade ago - before Turkish cherries took off. Ultimately, he says, U.S. farmers just want a level playing field. A supplement to this story was part of Point North. Listen to the entire episode here. Michigan cows are making national headlines. Last week, NPR’s Morning Edition covered a story by Dan Charles on the cattle tracking program in Michigan. The state of Michigan requires cattle to have electronic ear tags. In fact, it is the only state that requires the tags. This mattered little to the general public until now. Some farmers are looking at how the tags could help consumers learn more about where meat is from and how it was raised. Michigan Radio’s Mary Jo Wagner first reported on the tracking system back in 2001. Originally, Michigan started the electronic tracking system in order to monitor cattle for tuberculosis, mad cow disease, and foot-and-mouth disease. Now, the local food movement and recent exposés on cruelty in the meat industry have given the tags a new use. The Midwest’s persistently high unemployment rate isn’t expected to fall anytime soon. But as Changing Gears' Kate Davidson reported, temporary employment agencies across the Midwest can’t seem to find enough people to fill all the open factory jobs they have waiting. These agencies are busier than they’ve been in years, because manufacturing has more open jobs than candidates willing or able to fill them. Now, another industry finds itself in a similar position: agriculture. It's a big business all across the Midwest. In Michigan, agriculture is said to be the state’s second largest industry and is still growing. But, Jim Byrum of the Michigan Agri-Business Association says agriculture producers can’t find enough people to fill jobs now, and he’s even more worried about the future. “The industry demand is pretty solid, and it’s an increasingly severe problem,” Bryum says. A large group within the agriculture industry -- white collar workers at agri-business companies -- is getting ready to retire soon. His concern is that a new generation of workers is not ready to replace those workers getting ready to leave.